For a Red Sox team suddenly lacking Babe Ruth in 1920, having Tim Hendryx for that year helped soften the blow. He didn’t hit many home runs; in fact, he didn’t hit any. But he did drive in 73 runs, and he hit .328 with a .400 on-base percentage. It was, by far, his best year in the majors. Hendryx came from a modest background. His father, William, was a stonecutter. His mother, Nancy (Neeley) Hendryx, gave birth to six children – Alva, Sarah, Cecil, Timothy, Ettie, and Louis Clinton. Timothy Green Hendryx was born on January 31, 1891, in Le Roy, Illinois. The Cleveland Naps bulked up as the 1911 season progressed, with as many as 46 players under their control, a relatively large number for the era. In the first days of August, they exercised options on five minor leaguers, asking them to report on August 20. Meanwhile Cleveland scout Bob Gilks recommended young Tim Hendryx, and team owner Charley Somers signed him. Gilks “saw the kid in action in several games and considers him a good prospect.”3 He reported for duty on August 25. Hendryx was a bit stocky, with 170 pounds on a 5-foot-9 frame. He was right-handed. He joined Cleveland in time for a September 4 debut, pinch-running in the eighth inning to no avail. He appeared in four games, the next three at third base, garnering eight plate appearances. He was 2-for-7 and had a sacrifice hit. He handled all nine chances without an error. Cleveland assigned Hendryx’s contract to the New Orleans club and he did open 1912 with the Pelicans. Suffering a split finger in June, he volunteered to play outfield rather than third base and “made several circus catches and he saved the Pels game at Mobile, when he speared a liner against the fence.”5 Hendryx never returned to third base. He hit .278 in 125 games for New Orleans. Cleveland exercised its option on Hendryx in August and brought him back as an outfielder after the Southern League season. Cleveland manager Harry Davis resigned right at the beginning of September and Joe Birmingham was the skipper when Hendryx joined the Cleveland club again. He arrived in time to play in 23 games, all in the outfield, and hit .243 with 14 RBIs, as well as his first home run. The homer was hit in the second inning of the September 27 game in Cleveland and actually was hit through League Park’s left-field wall – “the ball bounded through a hole in the fence.”6 It was a three-run homer off Detroit’s Charlie Wheatley. In the eighth inning, Hendryx repeated the feat – or so it seemed. The ball went through the hole in the fence but this time umpire Silk O’Loughlin called it a foul ball. Looking ahead to 1913, manager Birmingham considered Joe Jackson and Jack Graney as set for the outfield, and felt that Hendryx could benefit from more time in the minor leagues. Hendryx played for New Orleans in both 1913 and 1914. In 1914, he hit .286. There had been another benefit to playing in the Crescent City in 1912. Hendryx spent the winter there, too, romancing Elsie Ella Eckhardt. The two married on May 15, 1913. Her father was Charles Eckhardt, a dentist. She herself had been a ballplayer on her championship high-school team. Was it a mutual love of the game that brought them together? Not at all, she told the New Orleans Times Picayune: “I met him in a grocery store. He had had ptomaine poisoning, but he had not had a shave, not for a week and yet … I think I fell in love with him then.”7 The one child the new couple had was Timothy Jr.
On August 15, 1915, during yet another season for New Orleans, and while he was leading the league in batting, the New York Yankees purchased rights to Hendryx’s contract. Bobby Gilks was now a New York scout, which helped pave the way. Hendryx was due to report in September after the Southern League season ended. He’d had a very good year for the Pelicans, batting .325 – good enough to come in second in the Southern Association, just behind Elmer Miller (.326) of Mobile. His last game for New Orleans was one of his worst; the nadir was when he was caught “on a species of hidden ball trick.”8 After he reported to New York, Hendryx played in 13 late-season games, hitting .200. Hendryx got into 15 games for the Yankees in 1916, coming off another full minor-league season – this time for Richmond in the International League; he hit .321. For New York, he hit .290 in 62 at-bats. Hendryx been a bit of a union man, and it might have cost him what proved to be his first significant season. 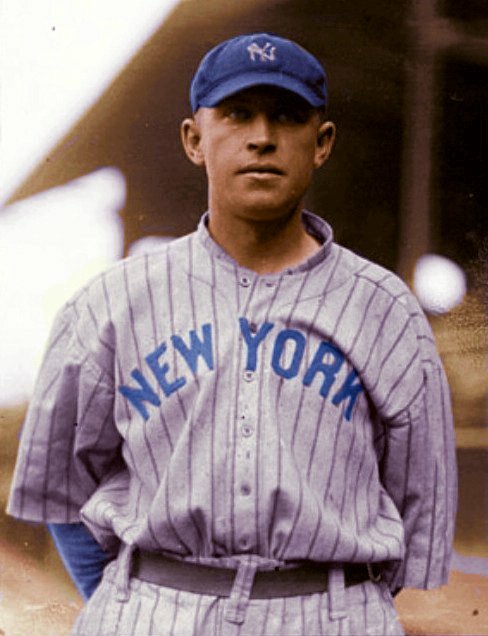 In February 1917 Sporting Life reported, “Chick Gandil of the Clevelands and Tim Hendryx of the Yankees have announced that they will not sign with their employers until the Union calls off the strike.”10 Matters were resolved, and Hendryx did indeed sign with New York. In 1917 Hendryx spent the full year with the Yankees, taking advantage of an opportunity that opened up when Frank Gilhooley was injured. He got in some good playing time, though he rarely made headlines. June was a good month for him. His four RBIs on June 2 were the difference in an 8-4 Yankees win over the Tigers. His hit in the 12th inning won a June 12 game against the White Sox. Two homers on June 21 beat Boston, 3-2. Hendryx appeared in 125 games, hitting for a .249 average, with five homers and 44 runs batted in. On March 9, 1918, Hendryx was part of a three-team trade. He was traded to Cincinnati and then immediately from Cincinnati to the St. Louis Browns. He played in 88 of the team’s 122 games (the season was shortened by the World War), and hit for a .279 average. He drove in 33 runs, six of them coming in three-RBI games on July 6 and August 18. Hendryx left the team a few days early to take a position with a shipbuilding plant in Mobile. He may have left unexpectedly early, as John Kieran wrote in the New York Times a couple of decades later. On August 27 New York was hosting the Browns for a doubleheader at the Polo Grounds. Jimmy Burke was the Browns manager and Hendryx had started the first game in center. “But in the seventh inning Jimmy Burke came tearing out of the St. Louis dugout screaming ‘Stop! Stop!’ The pitcher stopped. The game stopped. Jimmy pointed to center field. It was vacant. Tim had disappeared. They didn’t hear of him for months. Finally they got word. He was in the army. While the game was going on, the St. Louis center fielder had gone off to war.”11 The story is questionable. He had been replaced during the first game by Pete Johns, but Johns had three at-bats and Hendryx only one, making it unlikely the change happened in the seventh. There was no mention in the next day’s Times, and the St. Louis Post Dispatch of the 28th said that Hendryx had informed the team that he would leave for an “essential” job at Mobile after the game on that date.12 But it’s a good story. On January 22, 1919, the Browns sold Hendryx outright to the Louisville Colonels. He played well, becoming the first hitter in the American Association to reach 100 hits. He hit .368 in 143 games, enough to lead the league by 19 points over the second-place batter.13i He also stole 30 bases. And Hendryx did a decent job, hitting .328 and driving in 73 runs – both career highs. He didn’t match Babe Ruth’s stats, but he did lead the Red Sox in both categories. He drove in three or more runs in eight games. In a couple of games, his defense in the outfield earned a newspaper subhead. The only homers Hendryx hit for the Red Sox were in spring training, though he struggled a bit with lameness in the spring of 1921. He did help out, though; his walkoff single on May 2 beat the Yankees, 2-1. But his hitting wasn’t what it had been just the year before. On June 20 Hendryx suffered a fracture of the little finger on his right hand while fielding. He played in only three more games. On July 30 the Red Sox and Yankees worked out a trade, which resulted in Hendryx going to St. Paul. He’d hit .241 with 22 RBIs in 49 games for the Red Sox, his last games in the big leagues. With St. Paul he played in 54 games and hit .330. Hendryx was back with St. Paul in 1922, and hit .341 in 108 games. On December 8 his contract was sold to San Francisco. In 1923 through 1925, Hendryx played for the San Francisco Seals in the Pacific Coast League. He hit .339, .319, and .303. The Seals repeated as Coast League champs in 1923 and won the pennant again in 1925. Hendryx started the 1926 season with the Seals, but was dealt to Mobile, where he ended his pro career. He hit .171 with San Francisco before the trade; he enjoyed a .314 average in 34 games with Mobile. In June 1924 Hendryx married Shirley Lamphere of St. Paul. After baseball, he worked as a taxicab driver and paint contractor. The 1940 census found him in Corpus Christi, Texas, as a cab driver for Checker Cab, living with a new wife, Maudine, with his uncle Alva, and with Timothy Jr.
After his retirement, Hendryx died of a heart attack on August 14, 1957, in Corpus Christi. In addition to the sources noted in this biography, the author also accessed Hendryx’s player file and player questionnaire from the National Baseball Hall of Fame, the Encyclopedia of Minor League Baseball, Bill Lee’s The Baseball Necrology, Retrosheet.org, and Baseball-Reference.com. 1 Charleston News and Courier, August 23, 1911. 2 Cleveland Leader, January 25, 1912. 3 Sporting Life, August 5, 1911. 4 Cleveland Plain Dealer, March 28, 1912. 5 New Orleans Item, June 28, 1912. 6 New Orleans Item, September 28, 1912. Sporting Life said the ball rolled under the fence. See the October 5 issue. 7 New Orleans Times Picayune, September 19, 1915. 8 New Orleans Item, September 16, 1915. 9 New Orleans Times Picayune, October 16, 1915. 10 Sporting Life, February 17, 1917. The union in question was the Players Fraternity, which had urged its members not to sign contracts for the 1917 season, but then backed off its threat to strike..
11 New York Times, April 26, 1937. 12 St. Louis Post Dispatch, August 28, 1918. 13 See, for instance, the New York Times of January 27, 1920. 14 Boston Globe, March 5, 1920. 15 Boston Globe, March 6, 1920. 16 Boston Globe, March 12, 1920. 17 Letter from Betty Jane Mooney to Joe Simenic dated July 30, 1969, found in Hendryx’s player file at the National Baseball Hall of Fame.